The night before hitting the old El Camino Real, the three-century-old highway built by the Spanish, I looked over the map of California. The plan was to drive south to the Nuestra Señora de Soledad mission in the Salinas Valley and then on to Mission San Antonio de Padua. But Soledad, I saw, was not only home to one of the old Spanish missionary outposts; across the freeway, the map warned me, was a maximum security prison. Mission San Antonio wasn’t much better off: It is on a US military base where soldiers train for deployment to Afghanistan and Iraq. Such is California, with the sacred, the profane, and everything in between. Although state landmarks, the 21 Spanish missions remain secluded and rarely visited. Pegged along Highway 101, formerly El Camino Real, and mostly in rural enclaves, they offer visitors snapshots of an almost primordial California. These quiet, well-preserved colonial outposts are off-the-beaten-path destinations in this busy state of freeways, Disneyland, and Hollywood. So essential are the missions to the state’s history that every pupil there is required to learn about them. Then they tend to forget or forego them as adults. Or at least that’s what happened to me, a native Californian now living in Germany. That is, until a German friend with whom I was travelling around San Francisco suggested we visit the wine-growing Napa Valley. Farthest north in the chain, Mission San Francisco Solano, as it is properly known, boasts a flawlessly whitewashed façade, bordered here and there by massive cacti and bougainvillea. Built in 1823, the Mexican government—as opposed to the Catholic Church—spearheaded the construction in an effort to stave off Russian furriers from the north. The mission’s exhibit also describes the missionaries’ early wine-making attempts, a legacy that lives on in the region. That visit in 2007 to the Solano Mission would spur me on, over the years, to include one or two missions to my California visits every year, making my missions a mission unto itself. Many missions have had to be reconstructed as they have fallen into disrepair, but architects have stayed true to the original designs. Some were built more elaborately than others. San Carlos Borroméo de Carmelo Mission, at Carmel, with its corpulentfaçade, cupolas and well-tended gardens, was considered Fr Junípero Serra’s favourite destination, and he’s buried there. The Franciscan priest from Spain, is credited with initiating the mission constructions, starting in San Diego and inching northward. 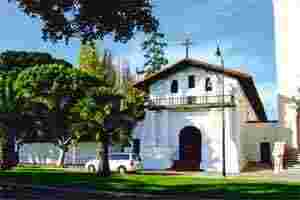 Compared with the plain white adobe façades and single bell off to the side, like the missions at Soledad and Sonoma, the missions at Carmel, Santa Clara, Santa Barbara and San Diego, for instance, look more like basilicas. But I’m in search of more at Mission Dolores: the cemetery featured in Alfred Hitchcock’s Vertigo (1958), where Jimmy Stewart shadows Kim Novak’s mysterious stroll among the tombstones. The caretaker led me there. Little seemed to have changed since Hitchcock and his crew were here. My imagination ran wild, too, at finding tombstones dating to California’s Gold Rush days, when the city was filled with fortune-hunters. From Mission Dolores, and with scenes from Vertigo still on my mind, I drove south to Mission San Juan Bautista, the largest of the missions. The final scene in Vertigo has Stewart pushing Novak to her death from Bautista’s belfry. Perhaps more notoriously, though, Mission San Juan Bautista sits atop the San Andreas Fault. While Dolores was spared damage in the 1906 quake, Bautista’s outer walls were levelled and remained unrepaired until the mid-1970s. Inside the mission church, I looked at the red tile floor along the central aisle, where bear and coyote tracks could be seen, likely made while the tiles were fresh and still drying in the sun. Back outside, I looked out to the Salinas Valley, the proverbial “Salad Bowl of the World", admiring the checkerboard of vineyards, crops of lettuce, strawberries and broccoli. On my most recent mission tour, I left the El Camino Real for the coast, driving along a lonely road that burrows into the Santa Lucia Mountains and skirts the San Antonio River. I turned on to Fort Hunter Liggett military reservation, with bivouacs and camouflage netting everywhere, and sceptically followed the signs to Mission San Antonio de Padua. Historians say the area is what the Spaniards likely encountered more than two centuries ago, with the rugged terrain and surrounding fields of wild flowers. After picking up a mission guide, I inspected the gristmill that remains from missionary days, and read that the first Christian wedding in California was performed here on 16 May 1773. Inside the mission, a young woman greeted me. 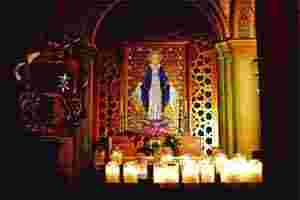 “We’re hard to get to," she told me, confirming the mission’s name, the Spanish soledad, meaning solitude in English. But what a treat for the visitor: the pink and yellow roses were plush, the lavender rustled in the wind and spread its distinct scent, and the silence allowed for a bird fountain’s trickle to be heard clearly. The freeway, strip malls, housing developments, all that exemplifies modern California, were so distant. I told the caretaker of my surprise at the nearby prison, and my journey to some day visit all of the missions. She laughed, and said that she volunteers every month with a programme that brings prisoners’ children for visits. A modern-day beatitude of sorts, I thought, as I returned to the mission garden to listen to the bird fountain.